A group of militant winemakers has appeared to claim responsibility for an arson attack on two telephone exchanges which left thousands without communications. Thousands of people in the Haute-Garonne near Toulouse were left without a telephone or internet connection following the attack on two telephone exchange points on Saturday to Sunday night, according to a report by leparisien.fr. 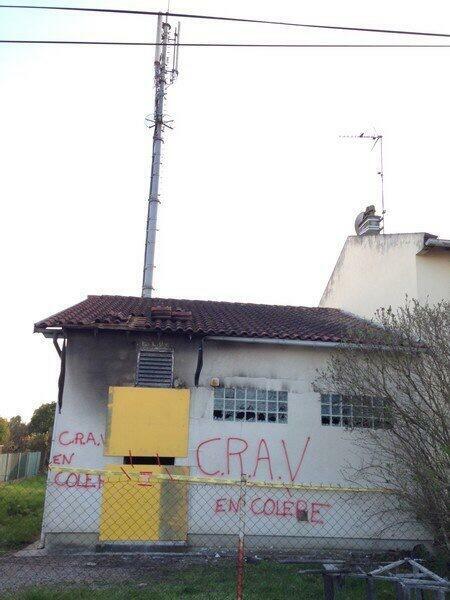 “CRAV”, which stands for the Comité régional d’action viticole (Regional Committee of Wine Action), was scrawled on the wall. Since the 1970s CRAV, a group of quasi-terrorist winemakers from the Languedoc, have claimed responsibility for a number of acts of vandalism, arson and bombings and allegedly blew up the party headquarters of the Socialist Party in Carcassonne last July. Earlier this year a menacing letter claiming that a recent helicopter crash in Bordeaux was not an accident was sent to a local newspaper as well as estate agents in the area. It was thought the mysterious letter was sent by CRAV. CRAV is mainly active in Languedoc-Roussillon in the south of France and operates with the aim of drawing attention to the difficulties facing winemakers in the region. Wow. I never thought I would read a headline like that.